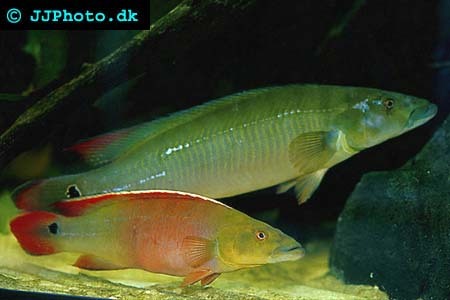 Cichlids belonging to the genus Crenicichla are often referred to as Pike Cichlids. In the wild, Crenicichla species are found in freshwater streams, rivers, lakes and smaller pools in the Amazon region in South America. Certain Crenicichla species are native to regions north of the Amazon River and live in Venezuela, Colombia and Guyana, while others can be found in coastal areas all the way down to central Argentina on the southern end of the South American continent. Most Crenicichla species live in warm waters, but some species are adapted to colder water temperatures, e.g. the Crenicichla species that live in Uruguay and Argentina. The average size varies a lot between different Crenicichla species. A dwarf Crenicichla will seldom grow bigger than 3-4 inches, while a medium sized Crenicichla will grow to around 6-10 inches. It is not uncommon for the largest Crenicichla species to exceed 24 inches in length. Even though their size and preferred environments can vary considerably, all the Crenicichla species share common features and behaviours. They are all fish and insect eating predators and will usually hunt by hiding and surprise their prey. Crenicichlas are often found lurking behind sunken tree branches, rocks and similar. Their predatory life style has made the Crenicichlas develop elongated bodies and wide mouths. The Crenicichla species are popular among aquarist, but the largest species will of course require a very large aquarium. Suitable dwarf Crenicichla species for the aquarist are Crenicichla notophthalmus, Crenicichla regain and Crenicichla urosema. These dwarf Crenicichla species are not only small, but also docile, and can therefore be kept in a 30 gallon aquarium. A more aggressive Crenicichla of this size will need at least 55 gallons. Crenicichla britskii and Crenicichla geayi are medium sized, but are still good choices for a 55 gallon aquarium since they are very peaceful. A more aggressive Crenicichla of this size would require 75 to 125 gallons. A 125 gallon aquarium can house the really large Crenicichla species, but they will do much better in a 240 gallon aquarium. Crenicichla species love plenty of room and the more the better. Always try to provide your Crenicichla with more space than just the bare minimum. The Crenicichla will do much better and it will display more of its interesting natural behaviour in a larger aquarium. When it comes to water quality, the largest Crenicichla species and the dwarf Crenicichla species are the most sensitive. The natural environment for theses species are the black waters of South America, where the levels of pollution and bacteria are low. 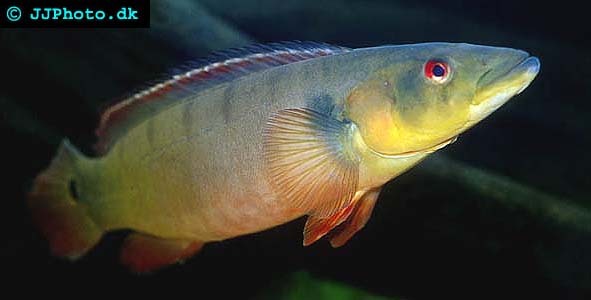 Typical symptoms of poor water quality in the aquarium include the hole-in-the-head disease, which is often seen in the large Crenicichla species. Dwarf Crenicichla species on the other hand will seldom display any treatable sickness; they will simply die from the effects of high nitrogen levels without any prior warning. The medium sized Crenicichla species are more robust, but large partial water changes must still be frequently performed if you wish to keep any Crenicichla species. Combine the water changes with forceful biological filtration. If you keep Crenicichla species native to black waters your must make sure that the pH stays between 5 and 6, especially if you want them to breed. Black water species also require very soft water. Since all Crenicichla species are predators, they should not be kept in the same aquarium as animals that they could consider prey. Most Crenicichlas will attack any fish smaller than them self. Keeping several Crenicichlas together will usually result in a lot of fighting, so if you want a peaceful aquarium similar sized fish from other species are the best companions to your Crenicichla. The best choice is fish species that look very dissimilar to the Crenicichla. Choosing fish species with body shapes and colours that are very unlike the Crenicichla species will decrease the risk of fighting a great deal. If you still want to keep several Crenicichlas together, e.g. for breeding purposes, the fish must be of roughly the same size. Aggression in the aquarium can be hampered by placing several PVC tubes in the aquarium. Provide each Crenicichla with its own tube, preferable even several tubes to choose between. The Crenicichla will love to hide inside its tube, and “out of sight, out of mind” seems to be very true for the Crenicichlas. As long as they do not have to watch other fishes, they will leave them alone. If you find the PVC tubes ugly you can decorated them and make them easier to hide in the aquarium setup. Feed you Crenicichla meaty foods; such as live fish, crustaceans, live earth worms, cut up fish etcetera. If your Crenicichla was born in captivity it will probably accept prepared foods, but wild caught specimens are usually very reluctant and will rather starve than eat prepared foods. If your Crenicichla was wild caught, live or frozen meaty food is therefore the best choice. If you have a Crenicichla that accepts prepared foods you should still supplement its diet with live and frozen meaty food, to make sure the fish receives all necessary nutrients.